Rebecca Blair’s career as a harpist and teacher has been both rich and varied. She has over 25 years of experience performing on the Celtic harp around the West Coast, her audiences including the President of Ireland, the Vancouver International Song Institute and the International Bar Association. As a studio musician, she has contributed to recordings such as “Orrachan” by Teresa Doyle, and “Nigawe Aski” by Sandy Skofield. Rebecca is active in the Vancouver music scene, performing both solo and with groups such as Triskellion. Rebecca’s musical studies began in the classical realm. After graduating with a Masters degree in clarinet performance and musicology from the University of Victoria, she has focused her interest on Celtic music and improvisation on the harp. She has attended many harp workshops all over North America and Ireland to study with such notables as Kim Robertson and Sharlene Wallace. For the last dozen years, Rebecca has given harp workshops in Vancouver and at Place des Arts in Coquitlam. 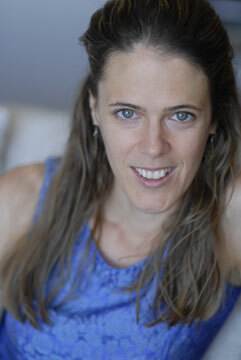 Rebecca keeps a busy schedule of teaching and performing, as well as studying Irish dance. Rebecca Blair plays a 36-stringed lever harp built by Jamie Newsom. 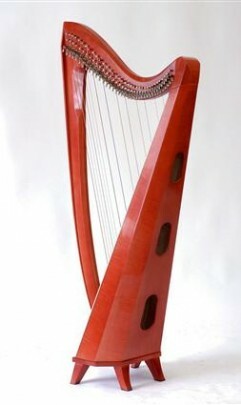 The harp has a walnut body and an Engelmann Spruce soundboard. It stands 57 inches tall and has a full rich tone. It has a pickup so can be amplified when needed. Jamie Newsom is a notable harp maker based in Bragg Creek. Rebecca is the West Coast representative for Newsom Harps, so feel free to contact her for more information about his harps.